I imported some Unity Kinect custom packages: Assets > Import Package > Custom Package and then navigated to the Kinect Unity Package location on my local disk. 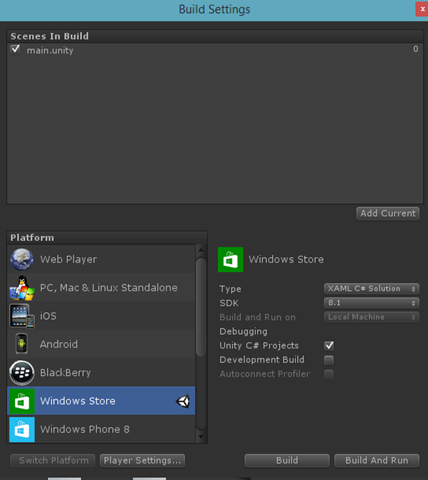 (the Kinect unity package can be downloaded here http://go.microsoft.com/fwlink/?LinkID=513177). 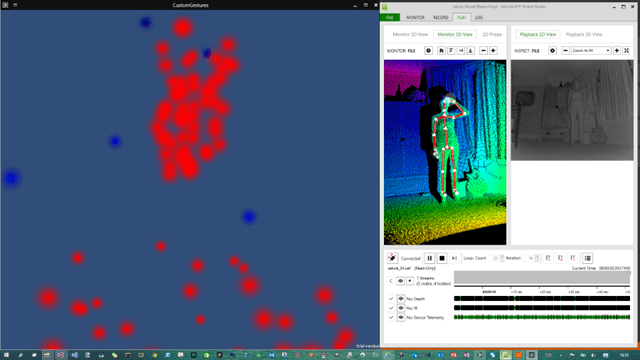 Add both the Kinect and Kinect.VisualGestureBuilder packages. As before, in this previous post I created an empty game object and also a new c# script and added the following code to detect the Kinect sensor, pull the body data, exposing it to other scripts and also to retrieve the body tracking ID which will be required to identify the body on which we are detecting the gestures. To keep things simple I assumed only one tracked body and as always remember this is intended as a sample so I may not be as careful with cleaning up event handlers, etc. This code is more or less the same as the code here http://peted.azurewebsites.net/visual-gesture-builder-kinect-4-windows-v2-code/. Once this script is in place you can set the ‘AttachedObject’ variable via the Unity3D UI by dragging a game object onto the field on the property editor. I created a particle system for the sample and dragged it on after changing some of the properties. 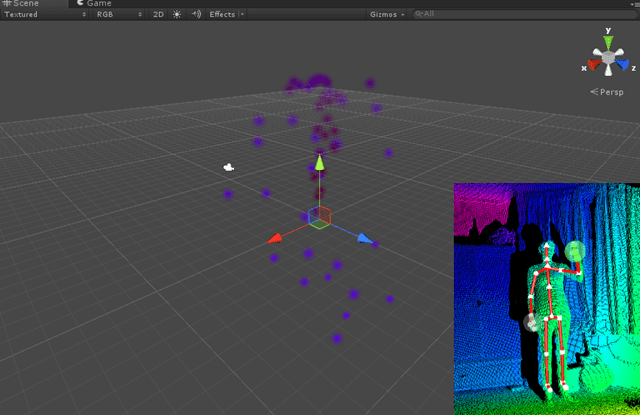 When a gesture is detected I use the progress value to alter some properties on the particle system; changing colours and emission rate. Notice that the code above imports the .gbd file from my previous post which contains a discrete gesture ‘salute’ and a continuous gesture ‘salute progress’. To access the database you can use using the streamingAssetsPath provided by Unity to gain access to local resources; more details here. 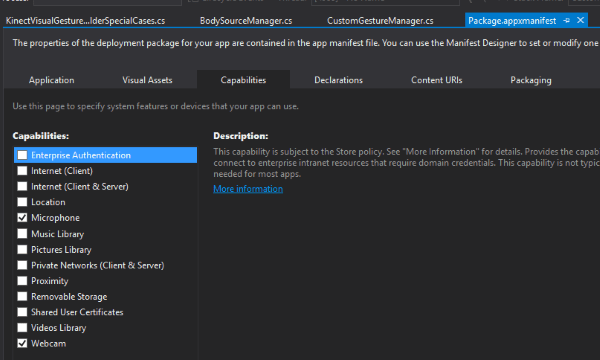 You can use the Unity File > Build Settings… dialog to configure the output project (in this case Windows Store output). These last two have caught me out on a number of occasions and it’s not always obvious when this is the cause of problems. This shows the final result captured mid-salute. Find the sample project here. I haven’t tested in unity 5 yet so will need to investigate further. Thanks for letting me know. 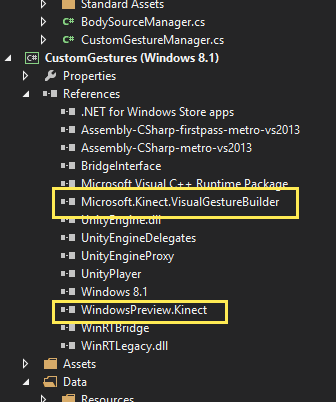 I am kinect gesture plugin for unity that comes with built-in gestures. I used VGB to create a few custom gestures and used your CustomGestureManager script. There are no errors in the script but when I run it there is an error in KinectSensor.cs saying KinectUnityAddin.dll not found exception. I don’t understand what’s wrong? I have put all the dll’s under Assets/Plugins folder. I tested today your implementation and it crashs every time when I want to acess to the data of the frame.DiscreteGestureResults. Do you have any hints or an idea? Im using Unity 5 (32 Bit). Hope you will see that, i’m using your scripts to get start with the gestures, but the method ‘Create’ of VisualGestureBuilderDatabase and VisualGestureBuilderFrameSource don’t exist.. what can i do?